"The Constitution Party of Pennsylvania applauds the ruling in U.S. District Court for the Easter District of Pennsylvania (on July 23, 2015), in which two parts of the Commonwealth's Election Code was determined to be unconstitutional. The Constitution of the Commonwealth of Pennsylvania, under its Declaration of Rights (Article 1) states that "Elections shall be free and equal; and no power, civil or military, shall at any time interfere to prevent the free exercise of the right of suffrage." Despite this language in our Constitution, elections have not been free and equal. With the recent ruling, we have moved towards a more level playing field. Specifically, the "major parties" cannot threaten third parties and their candidates with the costs associated with a challenge of signatures on nominating papers (petitions); additionally, the current method to determine the number of signatures needed to place candidates on the ballot was determined to be unconstitutional. 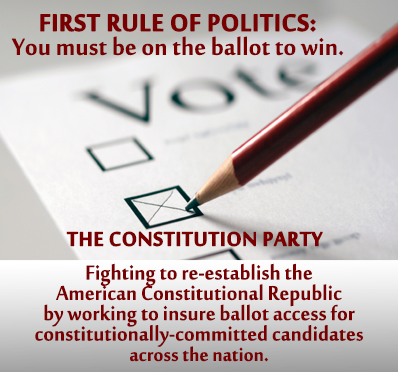 Much remains to to be done, and we, the members of the Constitution Party of Pennsylvania, must continue our efforts to not only place candidates on the ballot, but to get them elected so that we can bring our Commonwealth back to the principles in our Constitution. As such, we recognize this ruling was a positive step, but it is just one of many that we must make." ~ CPPA State Chairman Alan R. Goodrich Sr.
Click here for some great Educational Resources! This is an in depth study of the Constitution, clause by clause with its historical perspective and related disscusions at the time. Well documented!